The Lantronix SecureLinx Spider SLS200PS20-01 is a 1 port PS/2 & USB Remote KVM Over IP switch which provides secure KVM over IP (keyboard, video, mouse) management of servers over an IP network. Unlike traditional KVM switches on the market, the Lantronix Spider offers a flexible, scalable and affordable CAT5-based remote access KVM solution in a cable friendly, compact "zero-footprint" package. The latest addition to the SecureLinx family of IT/data center management products, this KVM over IP switch eliminates server-to-switch CAT5 cable distance limitations, and gives system administrators non-intrusive and cost-effective 24/7 access to servers across a wide variety of IT/network environments: from mission critical servers in high-density data centers, to servers distributed over corporate campuses, multi-floor buildings, remote/branch office sites. Management access, from BIOS to applications, from any web browser anywhere, at any time. 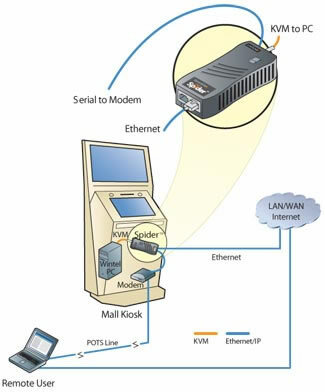 This IP KVM switch can be easily daisy-chained together using Lantronix SwitchPort+ integrated Ethernet switch technology. This provides a cost-effective solution in environments where numerous cable drops and distance limitations can be a challenge when adding servers. Spider delivers secure, non-blocked, BIOS level management access to servers, and no client software or external power supply is required.